Arts & Letters 24, which comes out of the Georgia College, has a story of mine, which is a piece of The Final Appearance of America’s Favorite Girl Next Door. Check it out. Buy a copy. The issue officially launches November 8. And while your at it, get yourself some DFW . 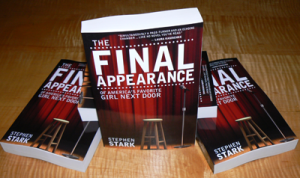 An excerpt from The Final Appearance of America’s Favorite Girl Next Door will appear in Arts & Letters in November. Of course, I highly recommend it. This is the novel I promised myself I’d have finished last year. Well, it’s now this year. I’m hanging this out there in the electronic universe just in case anyone wants to read and comment on it. I’m using Apple’s Pages to write it, and but to put it out there using Adobe’s interesting beta, I had to convert it to Word, which doesn’t get all of the formatting exactly right, and since I use fonts that you might not have, I’ve changed some of them to more or less universal fonts. Update: Acrobat.com is no longer in beta, and I don’t really have any use for it. You can see pieces of TBD on Fictionaut, if you really want to by using the link. This is a work in progress, in which on a day his wife has served him with divorce papers, his company is hinting at layoffs, and he is really in no condition for any more weirdness, the most unprecedentedly weird thing happens to him imaginable. He runs into himself, or, more literally, himself runs into him. This is not a guy who looks like him. This is him. If you want to take a look and give me feedback, please email me and I will give you access.